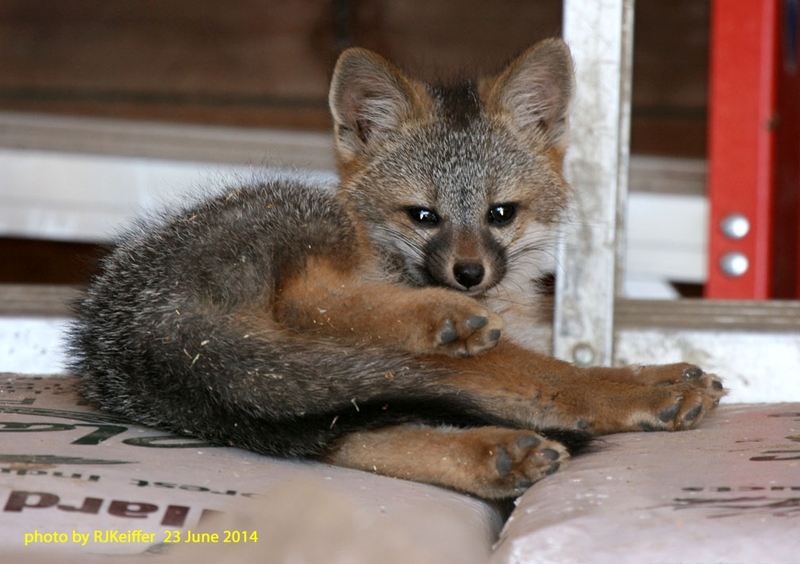 Field staff here at the UC Hopland Research & Extension Center have recently noticed a young family of Gray Fox (Urocyon cinereoargenteus) residing around the shop and headquarters area. This morning it was noticed that "mom fox" had moved them into a corner of the hay storage barn. The youngsters, about three of them, were having a grand time exploring the area under the Cushman scooters and ATVs, and basking in the morning sunshine. This small carnivorous mammal ranges over most of the United States and throughout Mexico and Central America. The genus Urocyon is limited to Gray Foxes and the Channel Island Fox, and is considered the most primitive of all the living canids. Bones of this species date back to the mid Pliocene epoch about 3.5 million years ago ... at a time when giant sloths, small horses, and large-headed llamas roamed the continent. The gray fox has the ability to climb trees, a trait shared by only one other wild Asian canid species. This fox species is omnivorous, and will eat a variety of food from rodents to insects to small rabbits along with fruits such as grapes. The species name cinereoargenteus means "ashen silver" referring to the silver hair color across the back and sides.